This configuration option is used to select a warehouse based on Vendor ID. The Integration Configuration screen can be opened in SAP Business One: SPS Integration > SPS Integration Setup > Integration Configuration. Choose Warehouse under the Section drop-down to Assign warehouses to Trading Partners. 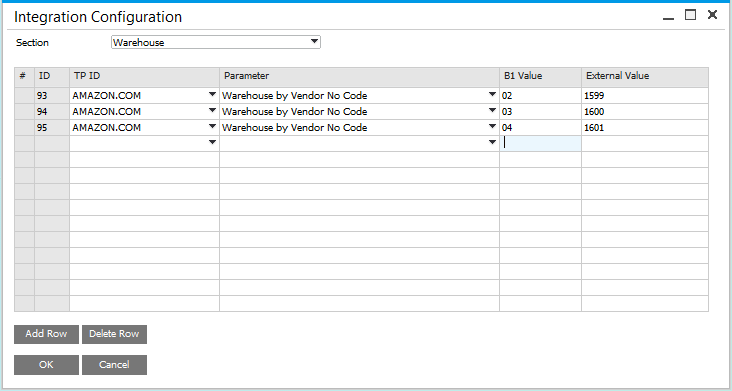 See the screenshot below for an example of mapping Warehouses to Vendor ID’s. Warehouse selection based on Trading Partner ID can be mapped as shown.